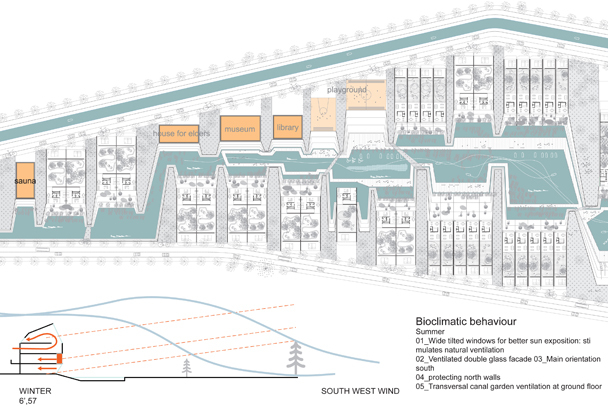 Sustainable housing and landscape project. Two existing neighbourhoods, a small river and a main road define the rectangular perimeter of this project. The brief was to make this inhospitable yet incredibly panoramic swamp into a residential area. 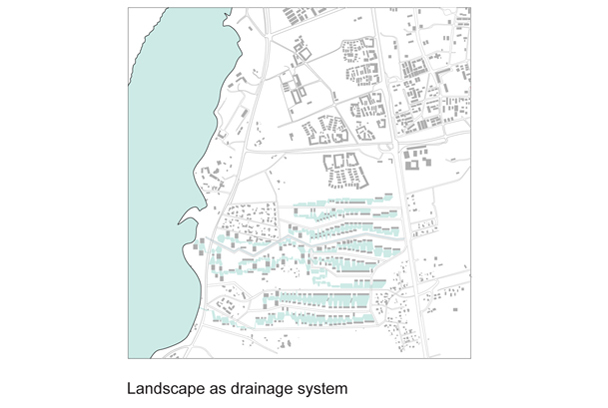 A new set of drainage channels set perpendicular to the river form the grid along which detached houses are aligned. The houses overlook the scenic waterways and private gardens extend to the rear. Services such as a nursery, shops and a swimming pool are located on one side just off the main road. As well as being picturesque and potentially providing a habit for local wildlife, residents can use the channels for sailing in the summer and ice-skating in winter.